I often post pie recipes because pie is generally pretty easy to make and something my family really enjoys! I like pie but now that I’ve met this pie, I LOVE pie! 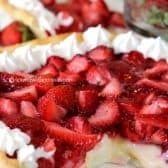 This amazing pie has a crust filled with a homemade cream filling that has been kissed with fresh lemon and then is topped with luscious fresh strawberries. Not only is it gorgeous, but it is seriously delicious! My family completely devoured this! 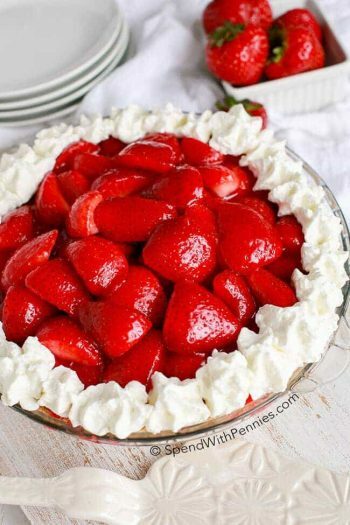 Keep in mind the recipe below makes 2 pies, which is perfect because these will not last long! Zest the lemon and juice 1/2 of it. Set aside. Combine sugar and flour in a medium saucepan. Stir in 1 cup of milk, egg yolks, salt and lemon zest. Whisk until well combined. Add remaining milk. Stir over medium-low heat until thick and bubbly. Remove from heat and stir in vanilla extract, butter and 1 tablespoon lemon juice. While still warm, pour half of the lemon cream into each pie crust. Cool completely. In a medium saucepan, stir together sugar, Jell-O, cornstarch and salt. Whisk in boiling water and bring to boil over high heat. Let boil 3 minutes stirring constantly. Cool completely. Once completely cool, pour over cut strawberries. 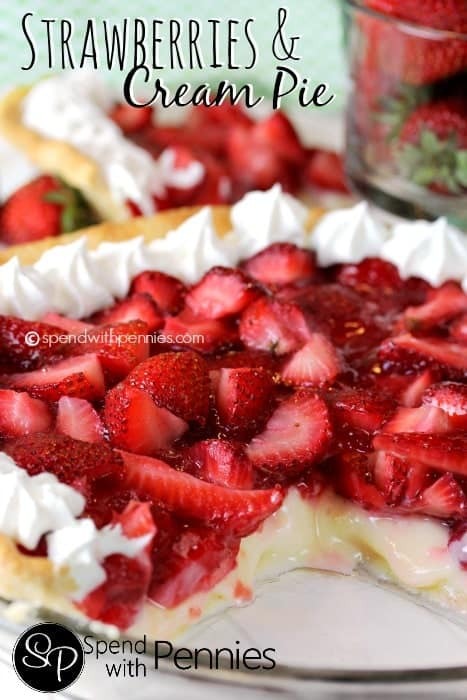 Gently spoon strawberries over cream layer and refrigerate pies 4 hours or overnight.